Unsuspecting homebuyers caught up in a $10 million scandal involving the Detroit Police and Fire Retirement System Board showed up at a board meeting last week hoping to have their concerns addressed. They were sent away, unheard. After taking care of some perfunctory issues, the board quickly went into closed session, and the frustrated victims (along with their supporters) were kicked out of a packed conference room on the ninth floor of the Coleman A. Young Municipal Center. They were told, however, that they would be put on the agenda for the board’s Nov. 29 meeting. That session cannot come quickly enough for dozens of people who have been left in limbo since discovering they may be forced from homes they thought they were trying to purchase. 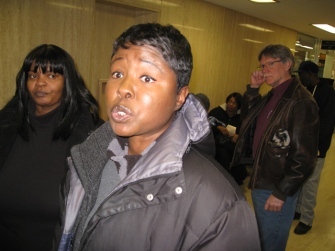 Detroit — Dozens of Detroit homeowners are fighting foreclosures of properties they bought from a fraudulent company that defaulted on loans from the city Police and Fire Retirement System. And while the pension fund has settled its claims against the company that it alleges fraudulently purchased about 2,500 properties in Wayne County, an estimated 100 families — most in Detroit — who live in some of those buildings are wondering what’s going to happen to them. That agreement gives the pension fund the right to sell all properties purchased with the loans. Paramount Land Holdings, formed by Abner McWhorter and George and Teresa Kastanes, secured some $10 million loans from the pension system in 2008 with the intent of buying and selling dilapidated homes to would-be rehabbers. The system, which handles pension investments for about 4,000 active and 8,000 Detroit police and fire retirees, was hoping for a profitable return on the investment. McWhorter committed suicide in summer 2011 and the Kastaneses fled the country after allegedly stealing $5 million in loan money. The couple have since returned, been arrested and are facing charges. The pension system settled with Paramount last month. Part of the settlement involved McWhorter’s mother, who agreed to turn over the Paramount assets and continue with the investigation. The settlement offered no consolation to some of the homeowners. Jackie Davis, 57, bought a home on Somerset on the city’s east side in January 2009 from Paramount. Just a few months later, she found a yellow package hanging on her front door saying she faced foreclosure because she owed $8,000 in back taxes that she thought had been paid. She had already paid a $1,000 delinquent water bill left over from when she bought the house, she said. She put thousands into a new roof, new floors and carpeting. After months of dealing with Paramount and associated companies and being told the taxes were taken care of, she received more tax foreclosure notices. “I was still trying to reason with these people, but still nothing was getting done,” she said. The foreclosure notices keep coming, she said. The phone number she had been calling is now disconnected. “It’s very hard because right now I’m fighting breast cancer,” she said. Detroit attorney Robert Day, who works for the Legal Aid & Defender Association and represents eight families affected by Paramount, said the pension board “screwed up by lending this money to Paramount. Detroit East English Village resident Nancy Brigham agreed. Brigham isn’t affected by the Paramount scandal, but came out Wednesday for a pension board hearing in support of those who are. She’s standing by the people who she said are doing their best to improve their homes and the city. The cases are now being looked at by an appointed Wayne County Circuit Court receiver, who must look at each case individually. A hearing is set for Dec. 17. “People are willing to pay their taxes, but they’re not willing to pay $10,000-$20,000 in taxes that Paramount should have paid,” Day said. Matt Gnatek, chairman of the pension system, said he’s hoping both sides can come to an amicable agreement. He said the decisions now rest in the court. “Hopefully, we can hash this out,” said Gnatek, a Detroit homicide detective. The homeowners, meanwhile, said they’re caught in the middle — victimized by the bankrupt company and by the pension officials trying to recoup their investment. “They’re trying to take homeowners out of the house we’ve put sweat equity in — we’re adding to the community,” said Greg Lane, who bought a house on Detroit’s west side in 2009. Lane, 51, installed a new furnace and a roof. He is fighting the foreclosure and a $2,800 back tax bill. Steve Bynum and Kim Pierce said they have spent thousands of dollars fixing up their Paramount-bought home on the west side. The couple, who are married, are facing foreclosure because of back taxes. They’ve organized neighbors and hope to make a statement at the next pension board meeting Nov. 29. “They’re still looking to collect, and they’re still looking to evict,” Bynum, 44, said. The Paramount scandal isn’t the first legal challenge facing the fire and police pension system. The system is part of a lawsuit also involving the city’s general retirement fund that claims investments were mismanaged. On Friday, the Michigan Court of Appeals ruled a 2009 lawsuit against the board and past and present pension board members can continue to be certified as a class action. The police and fire system has assets of about $3.4 billion and is separate from the city’s general retirement system. The police and fire fund, unlike the general system, is still nearly fully funded.